This quiet, beautiful beach goes for miles along a coastline protected by an extensive offshore reef. 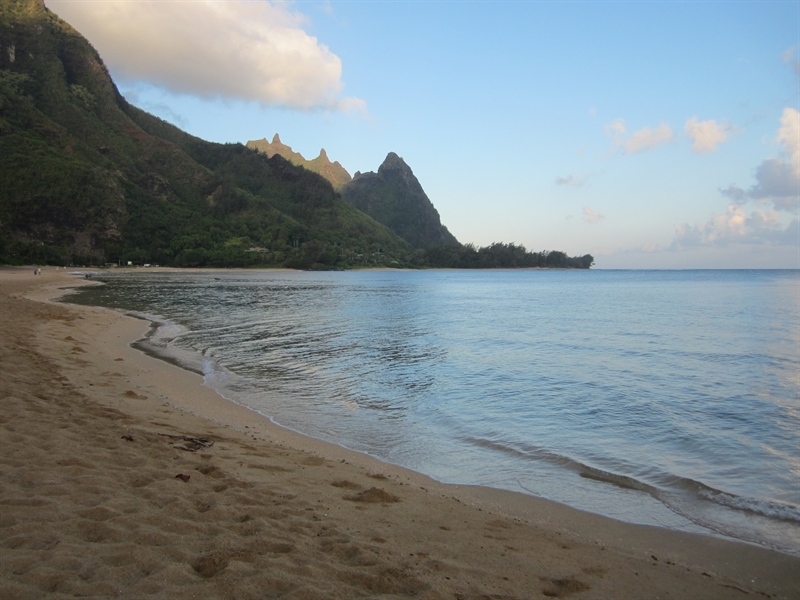 Anini Beach is well known as one of the safest and most protected beaches along the North Shore. This is because of a 2 mile long fringed reef runs the length of beach and is Hawaii’s longest reef. The beach access road is sometimes so close to the water that you could almost jump in from your car! Find your own little piece of paradise by meandering past the main entrance of the beach park and campground facility and pull off along the side of the road where you see a small, private beach. You can catch glimpses of expensive homes on the bluff above and water front of this beach. Anini is popular among windsurfers and campers. Follow the link for more information on camping and getting permits for overnight camping. The offshore reef creates a peaceful lagoon in most conditions and you can usually watch windsurfers from the shore. Windsurfing lessons are available from a few companies. Take Anini road through the residential area all the way to the western end and you will find a sandbar that extends way out into the ocean. This is a great spot for wading or fishing. Children like the calm water here and there are lots of very tiny sea shells right along the waterline. Many of the homes you see along Anini road are vacation rentals, so check here if you are looking for a quiet north shore rental. The sale prices are high but vacation rental rates are sometimes reasonable. In some places where the water is shallow snorkeling can be very good. However it will depend on visibility and conditions. Pole, spear and throw-net fishing is also done off shore here, in addition to sea weed harvesting. The beach also has a boat launch. In the summer this beach makes a great spot for sunset dinners, or just a relaxing spot to site and view the evening. It’s usually empty in the evening and you can watch the big sun fade into the golden water. This beach used to be called Wanini. There are two theories on how the W was lost. Some claim the W simply fell of the sign and others believe a local irate resident shot off the W with a shotgun, reveling what he believed to be the correct name, Anini Beach. At the far west end of the beach, across the channel is Wyllie Beach. Drive South on the 56 for 3.5 miles. Turn left onto the first Kalihiwai Rd. (Kalihiwai is a loop road, the second entrance is about a mile down the highway.) This will be 2 miles before the Kilauea Gas Station (usually the best priced gas on the north shore) between mile marker 25 and 26. Make a left on Anini Rd. after 1 mile. It’s 1.2 miles to Anini Beach Park along Anini Rd. Drive North on the 520 back to the 50. Make a right on the 50, drive 32.5 miles through Lihue, Kapa’a, and Kilauea. Turn right onto the second Kalihiwai Rd. (Kalihiwai is a loop road, the first entrance is about a mile back down the highway.) Make a left on Anini Rd. after 1 mile. It’s 1.2 miles to Anini Beach Park along Anini Rd. Beware of strong currents, dangerous waves breaking on the outer reefs, sharp coral and slippery rocks. High surf usually always means dangerous conditions including rip currents. During high surf, particularly in the winter, the current that is running parallel to Anini Beach can become strong. At times strong enough to pull even the best of swimmers out through the channel in the reef and into the open ocean. This channel in the reef is located at the western end of the park. Make sure to stay away from this area, if in doubt, and inside the reef. The channel at the very western part of the beach is where the water flows out so stay away from this part. Historically (as of 2012), 11 drownings have occurred at Anini Beach. Hello! 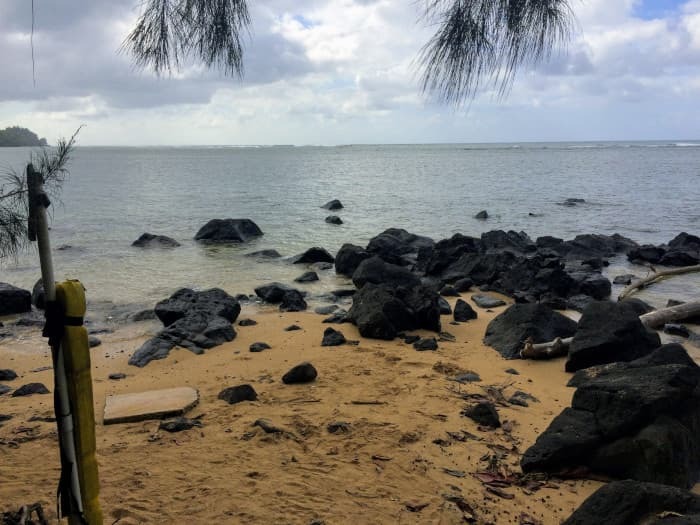 I'm interested in the Anini Beach Park property, with the URL https://www.kauaibeachscoop.com/listing/anini-beach-park/ and I'd like to be contacted for more details. Your Phone Your Email Captcha: 7 * 4 = ?